Black spots on the wall, fogged windows and it smells musty? It should not come so far. It is important to eliminate the cause of mould formation. By realizing an effective moisture proofing ventilation. Buildings are getting more and more air tight. Not without consequences. Since the German Energy Saving Regulation (EnEV) prescribes the tightness of building envelopes, the general conditions of building physics have been changed considerably. 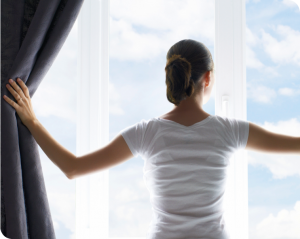 Due to sealing measures the normal ventilation behavior of residents alone often not suffices to keep the indoor humidity on an uncriticial level. Therefore, the following phenomenom is observed in series: In the course of energetic mondernization windows of existing buildings are replaced. As a result residents moan about massive mould growth. There is much debate and mutual recriminations. The mould is going to be removed professionally every winter, but forms again the next season. Course of mould formation needs to be eliminated. There is only one sustainable solution for this problem. The user independent air exchange needs to be raised again to the necessary level. The German ventilation norm DIN 1946-6 identifies the minimum air flow rate required for building physics as moisture proofing ventilation. Within an operational ventilation concept the normal humidity volumes arising in occupied rooms are compensated by a sufficient exchange of exhaust and wet air to fresh and dry air. The ventilation required is not high, but needs to be present permanently. We recommend to prevent mould damages by using window rebate vents. Since 1999 these products have been installed millions of times and it is proven that they implement an effective moisture proofing ventilation in apartments. The vents can both be installed in new windows and retrofitted in existing windows. They are neither visible from the outside nor the inside and come with an automatic flap control excluding draught appearances in case of strong wind and do not need any electricity. In case the apartment has windows on more than one facade we recommend to realize the window rebate vents in cross ventilation. Ideally, all windows are then equipped with rebate vents. Furthermore, interior doors are designed permeable to air – a perfect match is the INNOPERFORM® Air flow gasket. In this proven concept powered by wind and thermal lift fresh air streams through the window rebate vents in the apartment on the windward side and moves toward the lee by passing the air permeable interior doors. On the lee the exhaust air leaves the apartment, again through the window rebate vents. In case the apartment only has windows on one facade the concept of cross ventilation does not work. As these kind of apartments often have interior bathrooms, it is advisable to transport the exhaust air through permanently driven bath ventilators and to equip all windows with window rebate vents. Through these, fresh air slipstreams in the apartment because of the low pressure produced by the ventilator. Hereby, the bath ventilator operates on a sufficient base load and can accelerate to full load if required.